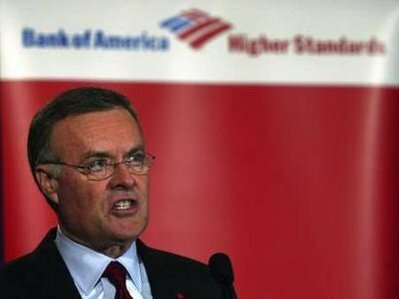 NEW YORK -- Two former employees of credit card issuer MBNA, now owned by Bank of America, said on Wednesday they were forced to use aggressive and deceptive practices with customers in order to boost revenues. Cate Colombo, from Maine, said she signed up for a customer service job but was instead instructed to make insistent sales pitches aimed at getting MBNA customers deeper into debt. "I was hired to sell money," she said on a conference call organized by Americans for Fairness in Lending, an advocacy group. "We had a goal of selling $25,000 an hour, $4 million per month. And I was one employee among hundreds, just at this one site." To meet these goals, Colombo said she was told to turn every regular call from a customer into a sales call. She would do this by running the customer's name through the computer and finding out every possible line of credit they had ever obtained through MBNA. She would then total the amount of credit outstanding and offer it to the customer as a blank check. MBNA was a bit lighter on disclosure details, such as telling customers that taking on more debt would reduce the borrower's credit score and thereby boost their outstanding interest rates. "If we didn't attempt to max out, we were considered insubordinate," said Colombo. In July, a US House of Representatives committee passed legislation aimed at curbing credit card billing practices that surprise borrowers with unexpected interest rate increases. It is unclear if credit card legislation will make it through Congress this year with the legislative session shortened by November elections.